LDD Weld Monitoring - Laser Mechanisms, Inc.
Laser Depth Dynamics’ (LDD) patented imaging technique is the only technology that delivers direct, geometric measurements of laser weld penetration – during the weld. Inline Coherent Imaging, or ICI, uses a low-power IR laser beam to gauge distances and the extra distance from the material surface to the bottom of the keyhole is the weld penetration. This measurement beam is directed through the same optics as the welding beam, getting focused right to the bottom of the keyhole’s vapor channel and returning the actual penetration in real time. The resulting data is equivalent to a lengthwise section of the weld, delivered instantly, with no additional labor and without destroying the part. No more destructive testing and weld quality data saved for each weld produced. 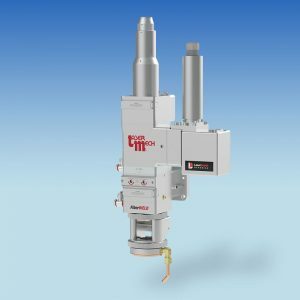 Inline Coherent Imaging (ICI) is flexible, with applications in a range of laser processes beyond welding, and the ability to measure a growing number of process-specific metrics. ICI-based seam tracking, height following, spot weld penetration and solidified surface inspection are just a few examples for welding applications. It can measure the surface features and depth of an ablation laser, as well as serve as a pierce through detector in aerospace drilling. 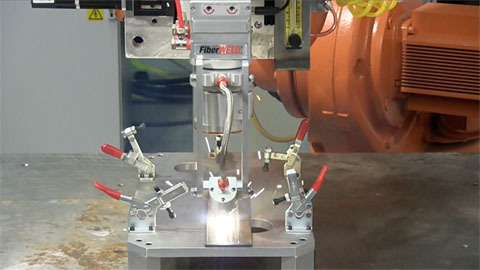 For additive processes, such as laser cladding and laser additive manufacturing, the ICI system can measure surface heights before and after another layer is added. The LD-600 is LDD’s flagship inline coherent imaging system. This instrument, when combined with a 3D Module and Laser Mech® focus head, offers the full range of ICI capabilities. Capable of seeing through the blinding process beam and plasma, the LD-600 can image the interaction region of your laser process with a sampling rate over 200 kHz. Whether you need real-time laser depth measurement and feedback, instant weld QC metrics, hundred-megapixel images of your process dynamics at a tens-of-microns resolution, through-the-lens autofocus and seam tracking, or more, the LD-600 can do it all. The LD-600 is made up of an LDD-600 rack-mount unit, its 3D Module mounted on Laser Mech® beam delivery, and a computer interface to interpret data and to allow for downloading of the data to a QC system. Inline coherent imaging (ICI) is the ideal process monitoring and control technology for laser welding, drilling and ablation. ICI yields unprecedented images of the interaction region in a wide variety of laser processing applications. Laser Depth Dynamics instruments are completely immune to being blinded by the process beam, plasma or other sources. LDD’s systems can deliver high-resolution, high-speed depth images of the entire process region, including the inside of the keyhole. On-line image analysis is possible, along with the ability to provide real-time feedback control of height, laser power and more. ICI can be used with all types of lasers; Fiber and Disk, Direct Diode, CO2, Green, UV, pulsed and CW. CW laser welding to over 10mm penetration, low power laser spot welding, surface ablation and drilling applications, as well as cladding and additive manufacturing surface measurements are all possible with ICI. The 3D Module enables the LD-600 to steer its measuring laser beam in real time. It is compact and lightweight, and designed into the Laser Mech® beam delivery, often taking up no more space than the inline camera it replaces. The 3D Module is what allows the LDD-600 system to direct its measuring capability to the weld zone for penetration monitoring, out in front of the weld for seam tracking, behind the weld to measure the topography of the solidified weld bead, and to continuously check the part height relative to the bottom of the keyhole – to make sure that the weld penetration measurements are referenced to the part and not to part surface or motion system variations. 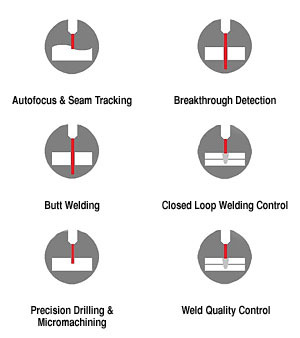 Laser Depth Dynamics’ OmniWELD is the most comprehensive laser weld monitoring solution on the market. OmniWELD combines four different ICI measurement modes (seam position, workpiece height, keyhole depth and weld surface) into a single simultaneous monitoring operation. The result is a single-instrument process monitoring suite that offers unprecedented versatility while allowing rapid customization. A single LD-600 running in OmniWELD mode can replace multiple existing measurement technologies and provide LDD’s industry-first penetration monitoring – at the same time. LDD’s multi-factor monitoring seeks out defects before, during, and after the weld process. The exact combination of pass/fail and control for each measurement stream is rapidly configured in software. You can create a tailored monitoring scheme for your process that has all the information you want, and none that you don’t.